The world works in the coolest of ways, and Heather + Cameron's story is a prime example! Years ago, they crossed paths, but the timing wasn't right. The world continued spinning, and their paths continued in their own directions. Then, last year, out of the blue, Cameron saw Heather's photo on a social media account. His heart stopped and raced, simultaneously. He knew that he had to find her. That instant he began his search, sifting through every Heather he could find on social media, that resided in Albuquerque. The search wasn't easy, and in the words of Cameron, "There are a LOT of Heather's! ", but he found her! He sent her a message, hopeful and anxiously awaiting her reply ... and within moments a reply came! They reconnected, completely hit it off, and have been together ever since. I guess you could say the timing worked out this time, as they'll be saying their vows this fall in front of the family and friends, and I can't wait to capture it! We began their engagement session by capturing the surrounding area of one of their favorite spots - The Ramen House. First, we hung out by the awesome graffiti wall, and then strolled around UNM campus, enjoying the greenery and lots of laughter with the kids. 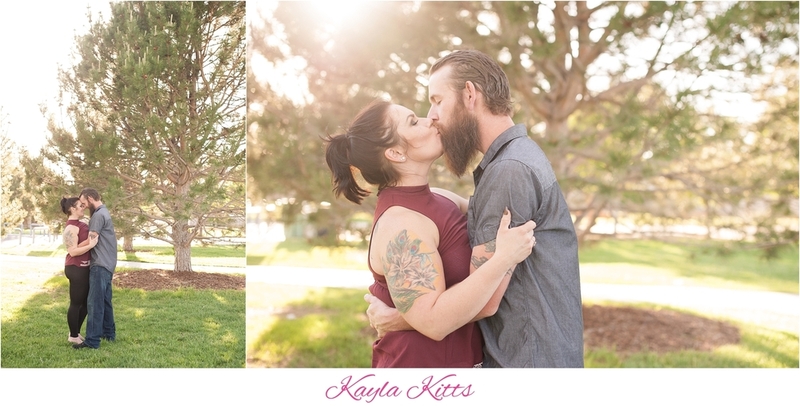 As the sun faded, we went to one of their favorite Albuquerque parks, and captured their snuggles as the sun dipped behind the horizon. They held each other close, daydreamed about their big day, and all was perfect! Thank you so much for choosing me to be a part of this wonderful time Heather + Cameron! Sending you all my love!